Die Mercurii, 1 die Junii. and on the Bill for the Synod. For the Earl of Warwick to be present at mustering the Essex Militia. and an Order about the late Sale of the Crown Jewels. Message to the H. C. to know what Information they have of the Sale of the Crown Jewels. Lord Admiral to send to the Earl of Warwick. Order about the King's Jewels. Earl of Suffolk and Ld. Dacres to attend. Earl of Rutland to put the Militia in Execution. 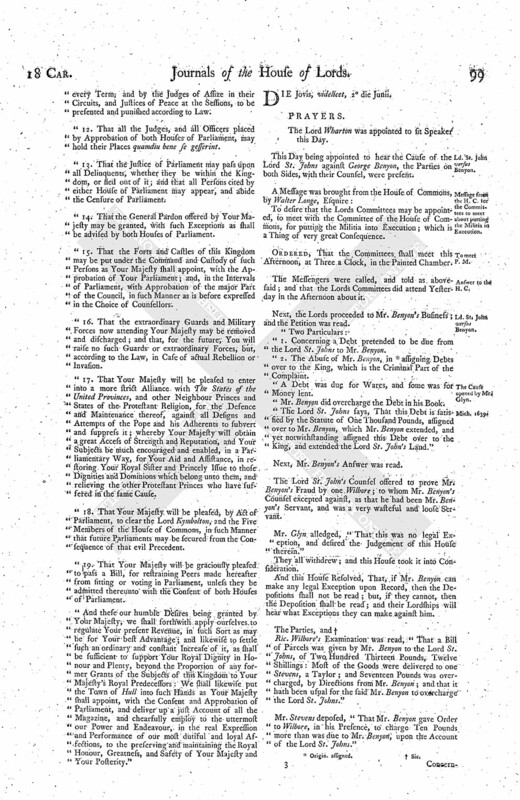 Conference, about the Propositions to the King, reported. Amendment to the Bill for the Synod. An Ensign of Sir J. Hotham's imprisoned at York, to be released. Addition to the Propositions to the King. For Committees to borrow Money of London, for Ireland. They agree that Doctor Hammond be One of the Synod. With Information of the Sale of the Jewels belonging to the Crown. with an Order for Ships to be searched on the North Coast. and with an Order to the Officers of the Ordnance to receive the Magazine from Hull. Referred to the Committee for the Militia. Committee to borrow Money of the City, for Ireland. Message from the H. C. that they agree to the Propositions to be sent to the King. and that they have also appointed a Committee for borrowing Money from the City. 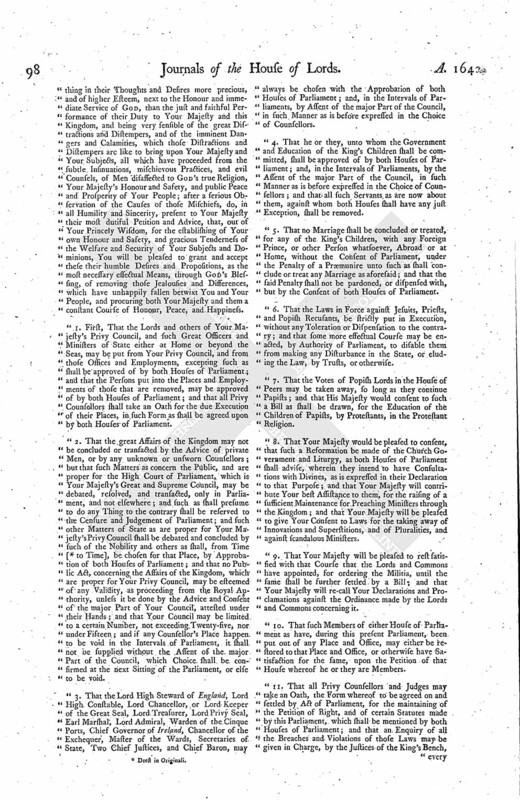 Parliament's Petition and Propositions to the King. Ordered, That the Petition of the Lord Morley is referred to the Earl of Holland, Earl Bedford, Lord Mandevile, who are to consider of the same, and report to this House. Ordered, That Captain Bell's Cause shall be heard before the Committees on this Day Sevennight. "1. To desire a Conference, touching the Propositions sent from this House to the House of Commons." "2. A Free Conference, touching the Bill of the Assembly of Learned Ministers." "3. Hasting the Two Bills of Innovations and scandalous Ministers." Answer: This House will expedite them. "4. To join with the House of Commons, to send to the Earl of Warwicke, to desire him to be personally present at the mustering of the Trained Bands at Burntwood, in Essex, on Tuesday next." 5. Touching somewhat which is to be delivered at this Conference, touching the Ensign imprisoned at Yorke. "6. To desire their Lordships Concurrence in an Order, concerning the Jewels of the Crown that have been sold lately." The House thought it fit to be informed, by the House of Commons, what Information they have that the Jewels of the Crown are pawned or sold away. To desire that, at this Conference, their Lordships may know what Information they have had that the Jewels of the Crown are pawned or sold. Whereas it doth appear to the Lords and Commons in Parliament, That the King, seduced by wicked Counsel, doth intend to levy War against His Parliament; and whereas Information hath been given that the Jewels of the Crown (which, by the Laws of the Land, ought not to be alienated) are either pawned or sold in Amsterdam, or some other Parts beyond the Seas, and thereby great Sums of Money provided to be returned to Yorke, or to some of His Majesty's Servants or Agents, for His Majesty's Use: And whereas it is more than probable that this great Provision of Monies, in such an extraordinary Way, is to maintain this intended War, and thereby to bring the whole Kingdom into utter Ruin and Confusion: It is therefore Declared, by the Lords and Commons in Parliament, That whosoever hath been, or shall be, an Actor in the selling or pawning of any of the Jewels of the Crown, or hath or shall pay, lend, send, or bring any Money in Specie into this Kingdom, for or upon any of these Jewels; or whosoever hath or shall accept of any Bill from beyond the Sea, for the Payment of any Sum of Money for or upon any of those Jewels, and shall pass such Sum according to such Bill, after Notice of this Order, without acquainting this House with the Receipt of such Bill before he accept the same, or, if he have already accepted any such Bill, then with the Acceptance thereof before the Payment of the Money; every such Person shall be held and accounted a Promoter of this intended War, an Enemy to the State, and ought to give Satisfaction for this public Danger out of his own Estate." Ordered, That a Letter be written to the Earl of Suffolke and the Lord Dacres, to desire Attendance on this House. Ordered, That the Earl of Rutland's Commission of Lieutenancy shall be sent him; and that he be required to put the Militia into Execution speedily. That they will send an Answer, by Messengers of their own. 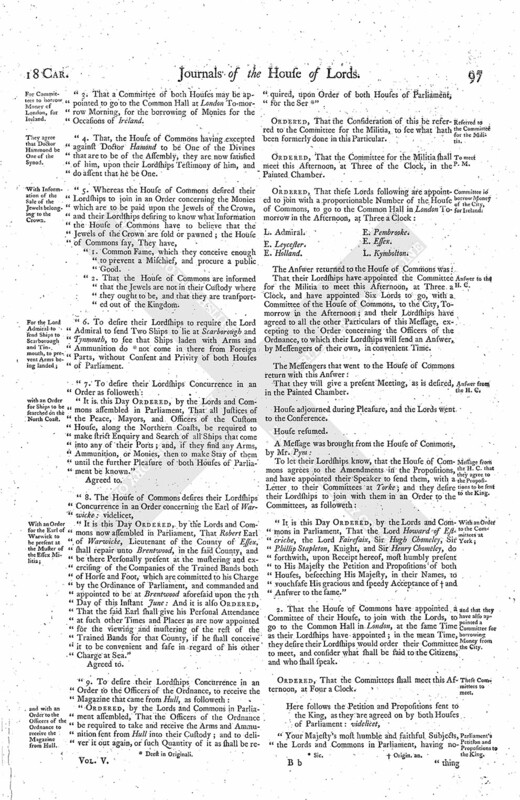 The Lord Wharton reported the Conference: "That whereas the Lords had communicated to the House of Commons some Propositions to be presented to the King; the House of Commons have made some Amendments and Alterations therein, and have added a Preamble and a Conclusion, and some more Propositions, wherein they desire their Lordships Concurrence. Next, that the House of Commons have agreed to the Amendments in the Bill for the Assembly; and do agree to all the Names of Addition, only Dr. Hamond. "That whereas they are informed that an Ensign of Hull, who was employed by Sir Jo. Hotham, is arrested and imprisoned at Yorke; and, because he was in that Service by Order of both Houses of Parliament, they desire their Lordships to join with them, to send to the Committees at Yorke, to know whether the said Person be committed only for that Service: If it be so, then to desire his Releasement, and declare that the Houses of Parliament take it as a Breach of the Privilege of Parliament, and make his Case their own. The House of Commons have thought of a Habeas Corpus to bring him; but they think it to be too long, and they know not his Name." Then the Particulars of this Message were severally read, and debated. Resolved, upon the Question, That this last Article shall be at this Time One of the Demands which shall be presented to the King. This House, having made some Alterations in the Propositions, Resolved, To communicate the same, by Message, to the House of Commons. To desire (fn. 3) a Conference, touching the Propositions lately brought up. "1. 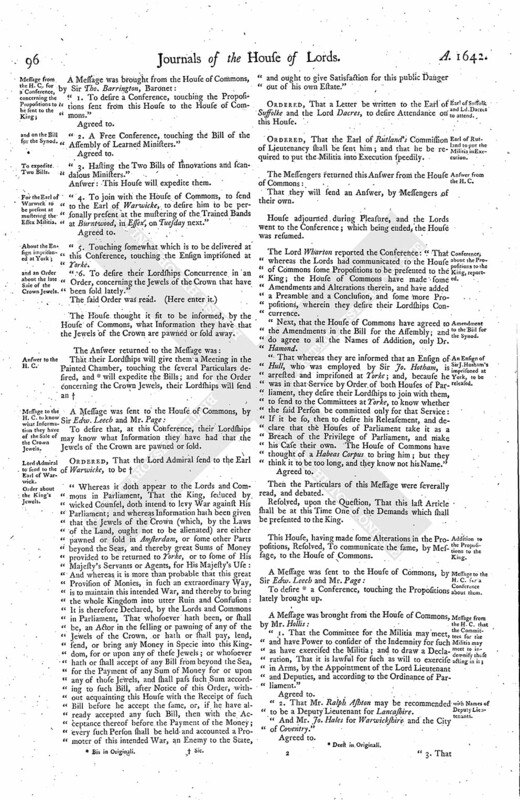 That the Committee for the Militia may meet, and have Power to consider of the Indemnity for such as have exercised the Militia; and to draw a Declaration, That it is lawful for such as will to exercise in Arms, by the Appointment of the Lord Lieutenant and Deputies, and according to the Ordinance of Parliament." 2. That Mr. Ralph Ashton may be recommended to be a Deputy Lieutenant for Lancashire. "And Mr. Jo. Hales for Warwickshire and the City of Coventry." 3. That a Committee of both Houses may be appointed to go to the Common Hall at London To-morrow Morning, for the borrowing of Monies for the Occasions of Ireland. 4. That, the House of Commons having excepted against Doctor Hamond to be One of the Divines that are to be of the Assembly, they are now satisfied of him, upon their Lordships Testimony of him, and do assent that he be One. 1. Common Fame, which they conceive enough to prevent a Mischief, and procure a public Good. 2. That the House of Commons are informed that the Jewels are not in their Custody where they ought to be, and that they are transported out of the Kingdom. 6. To desire their Lordships to require the Lord Admiral to send Two Ships to lie at Scarborough and Tynmouth, to see that Ships laden with Arms and Ammunition do (fn. 4) not come in there from Foreign Parts, without Consent and Privity of both Houses of Parliament. "It is this Day Ordered, by the Lords and Commons assembled in Parliament, That all Justices of the Peace, Mayors, and Officers of the Custom House, along the Northern Coasts, be required to make strict Enquiry and Search of all Ships that come into any of their Ports; and, if they find any Arms, Ammunition, or Monies, then to make Stay of them until the further Pleasure of both Houses of Parliament be known." "It is this Day Ordered, by the Lords and Commons now assembled in Parliament, That Robert Earl of Warwicke, Lieutenant of the County of Essex, shall repair unto Brentwood, in the said County, and be there Personally present at the mustering and exercising of the Companies of the Trained Bands both of Horse and Foot, which are committed to his Charge by the Ordinance of Parliament, and commanded and appointed to be at Brentwood aforesaid upon the 7th Day of this Instant June: And it is also Ordered, That the said Earl shall give his Personal Attendance at such other Times and Places as are now appointed for the viewing and mustering of the rest of the Trained Bands for that County, if he shall conceive it to be convenient and safe in regard of his other Charge at Sea." "Ordered, by the Lords and Commons in Parliament assembled, That the Officers of the Ordnance be required to take and receive the Arms and Ammunition sent from Hull into their Custody; and to deliver it out again, or such Quantity of it as shall be required, upon Order of both Houses of Parliament, for the Ser (fn. 5) "
Ordered, That the Consideration of this be referred to the Committee for the Militia, to see what hath been formerly done in this Particular. Ordered, That the Committee for the Militia shall meet this Afternoon, at Three of the Clock, in the Painted Chamber. That their Lordships have appointed the Committee for the Militia to meet this Afternoon, at Three a Clock, and have appointed Six Lords to go, with a Committee of the House of Commons, to the City, Tomorrow in the Afternoon; and their Lordships have agreed to all the other Particulars of this Message, excepting to the Order concerning the Officers of the Ordnance, to which their Lordships will send an Answer, by Messengers of their own, in convenient Time. That they will give a present Meeting, as is desired, in the Painted Chamber. House adjourned during Pleasure, and the Lords went to the Conference. "It is this Day Ordered, by the Lords and Commons in Parliament, That the Lord Howard of Estcriche, the Lord Fairefaix, Sir Hugh Chomeley, Sir Phillip Stapleton, Knight, and Sir Henry Chomeley, do forthwith, upon Receipt hereof, most humbly present to His Majesty the Petition and Propositions of both Houses, beseeching His Majesty, in their Names, to vouchsafe His gracious and speedy Acceptance of (fn. 6) and Answer to the same." 2. That the House of Commons have appointed a Committee of their House, to join with the Lords, to go to the Common Hall in London, at the same Time as their Lordships have appointed; in the mean Time, they desire their Lordships would order their Committee to meet, and consider what shall be said to the Citizens, and who shall speak. Ordered, That the Committees shall meet this Afternoon, at Four a Clock. Your Majesty's most humble and faithful Subjects, the Lords and Commons in Parliament, having no thing in their Thoughts and Desires more precious, and of higher Esteem, next to the Honour and immediate Service of God, than the just and faithful Performance of their Duty to Your Majesty and this Kingdom, and being very sensible of the great Distractions and Distempers, and of the imminent Dangers and Calamities, which those Distractions and Distempers are like to bring upon Your Majesty and Your Subjects, all which have proceeded from the subtle Insinuations, mischievous Practices, and evil Counsels, of Men disaffected to God's true Religion, Your Majesty's Honour and Safety, and public Peace and Prosperity of Your People; after a serious Observation of the Causes of those Mischiefs, do, in all Humility and Sincerity, present to Your Majesty their most dutiful Petition and Advice, that, out of Your Princely Wisdom, for the establishing of Your own Honour and Safety, and gracious Tenderness of the Welfare and Security of Your Subjects and Dominions, You will be pleased to grant and accept these their humble Desires and Propositions, as the most necessary effectual Means, through God's Blessing, of removing those Jealousies and Differences, which have unhappily fallen betwixt You and Your People, and procuring both Your Majesty and them a constant Course of Honour, Peace, and Happiness. 1. First, That the Lords and others of Your Majesty's Privy Council, and such Great Officers and Ministers of State either at Home or beyond the Seas, may be put from Your Privy Council, and from those Offices and Employments, excepting such as shall be approved of by both Houses of Parliament; and that the Persons put into the Places and Employments of those that are removed, may be approved of by both Houses of Parliament; and that all Privy Counsellors shall take an Oath for the due Execution of their Places, in such Form as shall be agreed upon by both Houses of Parliament. 2. That the great Affairs of the Kingdom may not be concluded or transacted by the Advice of private Men, or by any unknown or unsworn Counsellors; but that such Matters as concern the Public, and are proper for the High Court of Parliament, which is Your Majesty's Great and Supreme Council, may be debated, resolved, and transacted, only in Parliament, and not elsewhere; and such as shall presume to do any Thing to the contrary shall be reserved to the Censure and Judgement of Parliament; and such other Matters of State as are proper for Your Majesty's Privy Council shall be debated and concluded by such of the Nobility and others as shall, from Time [ (fn. 7) to Time], be chosen for that Place, by Approbation of both Houses of Parliament; and that no Public Act, concerning the Affairs of the Kingdom, which are proper for Your Privy Council, may be esteemed of any Validity, as proceeding from the Royal Authority, unless it be done by the Advice and Consent of the major Part of Your Council, attested under their Hands; and that Your Council may be limited to a certain Number, not exceeding Twenty-five, nor under Fifteen; and if any Counsellor's Place happen to be void in the Intervals of Parliament, it shall not be supplied without the Assent of the major Part of the Council, which Choice shall be confirmed at the next Sitting of the Parliament, or else to be void. 3. That the Lord High Steward of England, Lord High Constable, Lord Chancellor, or Lord Keeper of the Great Seal, Lord Treasurer, Lord Privy Seal, Earl Marshal, Lord Admiral, Warden of the Cinque Ports, Chief Governor of Ireland, Chancellor of the Exchequer, Master of the Wards, Secretaries of State, Two Chief Justices, and Chief Baron, may always be chosen with the Approbation of both Houses of Parliament; and, in the Intervals of Parliaments, by Assent of the major Part of the Council, in such Manner as is before expressed in the Choice of Counsellors. 4. That he or they, unto whom the Government and Education of the King's Children shall be committed, shall be approved of by both Houses of Parliament; and, in the Intervals of Parliaments, by the Assent of the major Part of the Council, in such Manner as is before expressed in the Choice of Counsellors; and that all such Servants as are now about them, against whom both Houses shall have any just Exception, shall be removed. 5. That no Marriage shall be concluded or treated, for any of the King's Children, with any Foreign Prince, or other Person whatsoever, Abroad or at Home, without the Consent of Parliament, under the Penalty of a Præmunire unto such as shall conclude or treat any Marriage as aforesaid; and that the said Penalty shall not be pardoned, or dispensed with, but by the Consent of both Houses of Parliament. 6. That the Laws in Force against Jesuits, Priests, and Popish Recusants, be strictly put in Execution, without any Toleration or Dispensation to the contrary; and that some more effectual Course may be enacted, by Authority of Parliament, to disable them from making any Disturbance in the State, or eluding the Law, by Trusts, or otherwise. 7. That the Votes of Popish Lords in the House of Peers may be taken away, so long as they continue Papists; and that His Majesty would consent to such a Bill as shall be drawn, for the Education of the Children of Papists, by Protestants, in the Protestant Religion. 8. That Your Majesty would be pleased to consent, that such a Reformation be made of the Church Government and Liturgy, as both Houses of Parliament shall advise, wherein they intend to have Consultations with Divines, as is expressed in their Declaration to that Purpose; and that Your Majesty will contribute Your best Assistance to them, for the raising of a sufficient Maintenance for Preaching Ministers through the Kingdom; and that Your Majesty will be pleased to give Your Consent to Laws for the taking away of Innovations and Superstitions, and of Pluralities, and against scandalous Ministers. 9. That Your Majesty will be pleased to rest satisfied with that Course that the Lords and Commons have appointed, for ordering the Militia, until the same shall be further settled by a Bill; and that Your Majesty will re-call Your Declarations and Proclamations against the Ordinance made by the Lords and Commons concerning it. 10. That such Members of either House of Parliament as have, during this present Parliament, been put out of any Place and Office, may either be restored to that Place and Office, or otherwise have Satisfaction for the same, upon the Petition of that House whereof he or they are Members. 11. 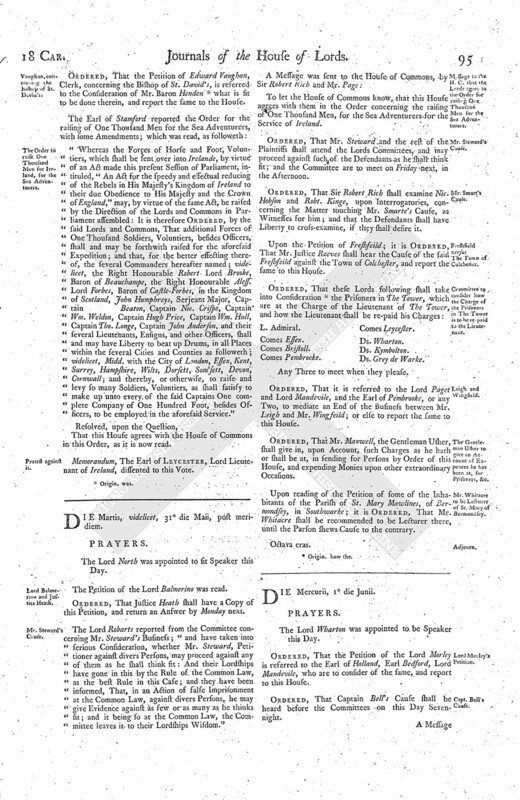 That all Privy Counsellors and Judges may take an Oath, the Form whereof to be agreed on and settled by Act of Parliament, for the maintaining of the Petition of Right, and of certain Statutes made by this Parliament, which shall be mentioned by both Houses of Parliament; and that an Enquiry of all the Breaches and Violations of those Laws may be given in Charge, by the Justices of the King's Bench, every Term, and by the Judges of Assize in their Circuits, and Justices of Peace at the Sessions, to be presented and punished according to Law. 12. That all the Judges, and all Officers placed by Approbation of both Houses of Parliament, may hold their Places quamdiu bene se gesserint. 13. That the Justice of Parliament may pass upon all Delinquents, whether they be within the Kingdom, or fled out of it; and that all Persons cited by either House of Parliament may appear, and abide the Censure of Parliament. 15. That the Forts and Castles of this Kingdom may be put under the Command and Custody of such Persons as Your Majesty shall appoint, with the Approbation of Your Parliament; and, in the Intervals of Parliament, with Approbation of the major Part of the Council, in such Manner as is before expressed in the Choice of Counsellors. 16. That the extraordinary Guards and Military Forces now attending Your Majesty may be removed and discharged; and that, for the future, You will raise no such Guards or extraordinary Forces, but, according to the Law, in Case of actual Rebellion or Invasion. 17. That Your Majesty will be pleased to enter into a more strict Alliance with The States of the United Provinces, and other Neighbour Princes and States of the Protestant Religion, for the Defence and Maintenance thereof, against all Designs and Attempts of the Pope and his Adherents to subvert and suppress it; whereby Your Majesty will obtain a great Access of Strength and Reputation, and Your Subjects be much encouraged and enabled, in a Parliamentary Way, for Your Aid and Assistance, in restoring Your Royal Sister and Princely Issue to those Dignities and Dominions which belong unto them, and relieving the other Protestant Princes who have suffered in the same Cause. 18. That Your Majesty will be pleased, by Act of Parliament, to clear the Lord Kymbolton, and the Five Members of the House of Commons, in such Manner that future Parliaments may be secured from the Consequence of that evil Precedent. 19. That Your Majesty will be graciously pleased to pass a Bill, for restraining Peers made hereafter from sitting or voting in Parliament, unless they be admitted thereunto with the Consent of both Houses of Parliament. "And these our humble Desires being granted by Your Majesty, we shall forthwith apply ourselves to regulate Your present Revenue, in such Sort as may be for Your best Advantage; and likewise to settle such an ordinary and constant Increase of it, as shall be sufficient to support Your Royal Dignity in Honour and Plenty, beyond the Proportion of any former Grants of the Subjects of this Kingdom to Your Majesty's Royal Predecessors: We shall likewise put the Town of Hull into such Hands as Your Majesty shall appoint, with the Consent and Approbation of Parliament, and deliver up a just Account of all the Magazine, and chearfully employ to the uttermost our Power and Endeavour, in the real Expression and Performance of our most dutiful and loyal Affections, to the preserving and maintaining the Royal Honour, Greatness, and Safety of Your Majesty and Your Posterity."